If you are visiting the beautiful town of Zell am See in the Austrian Alps and are looking to find the best hotels in Zell am See, hopefully this page will help you choose the best hotel to suit your needs, requirements and budget. Throughout both the Summer and Winter months, Zell am See attracts a large number of tourists whether it is for hiking, walking, cycling, sightseeing or skiing and snowboarding in the surrounding areas of the Hohe Tauern National Park, Kitzsteinhorn and Steinernes Meer to name but a few. Due to the large number of tourists that visit the town every year, Zell am See has many hotels that cater for a wide range of guests. Each hotel in Zell am See has its own unique charm and character, along with offer a range of different facilities for the guests. Everyone has their own personal preferences and requirements when it comes to the type of hotel they like and taking this into consideration, we have tried to provide you with the many different factors people consider when choosing a hotel in Zell am See. There are many factors that will determine which hotel in Zell am See you choose and these factors include price, location, amenities, facilities and budget. The hotels listed on this page, offer you a wide choice in terms of location, facilities and price. Whether you are wanting a hotel in Zell am See on the lake, near the train station, in the centre and Pedestrian Zone or by the slopes and ski lifts, there will definitely be a hotel to suit your requirements and needs. Located just 76 klms (45 miles) from Salzburg Airport, one of the plus points about visiting Zell am See, is that it is very easily accessible by train and choosing a hotel that is near to the train station (Bahnhof) in Zell am See, is a convenient place to stay. The train station in Zell am See is located at the bottom end of town and next to the lake, with easy access to the town, shops, bars and restaurants. If you choose to stay at a hotel near the train station in Zell am See, then obviously, when you arrive at the train station you will not have far to walk to reach your hotel. There are plenty of taxis waiting outside the train station if you would prefer to take a taxi to your hotel and there is are also local bus that run from outside the train station. Duing the Winter months, these local buses (Ski buses) are free and run throughout Zell am See, Schuttdorf and Kaprun, at regular times throughout the day. The following hotels are the best hotels in Zell am See that are located closest to the train station. Hotel Neue Post is a luxury 4-star hotel that is located in the centre of Zell am See and just 0.2 miles from the train station. The hotel is within easy walking distance of the train station (Bahnhof). The Hotel Neue Post, is also within easy walking distance of the main ski lift in Zell am See and is a very popular choice for visitors. Within easy reach from the train station and located very close to the main ski slope in the ‘Pedestrian Zone’, the 4 star Hotel Berner, is the ideal choice of hotels in Zell amd See. Perfect if you are arriving in Zell am See by train and are looking to stay near the town centre and have access to the ski slopes and ski lifts. 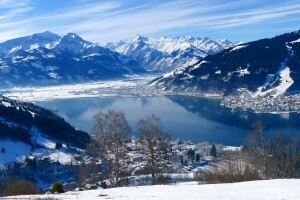 One of the main attractions in Zell am See is the lake and there are a couple of hotels that are located on the lake. The hotels that are located on the edge of the like or very close by, have fantastic locations. Obviously, these hotels are in high demand, especially during the peak seasons and as a result, generally command a higher premium price. One of the most famous and well known hotels in Zell am See, is the Grand Hotel. The Grand Hotel in Zell am See, boasts one of the most impressive locations, which is next to the lake. The hotel has its own private beach, which also offers a lawn for sunbathing during the hot Summer months. The rooftop spa at the Grand Hotel, allows guests to enjoy the stunning views as they relax and unwind after a days activities. The Hotel Seevilla Freiberg is another beautiful 4 star hotel that is located very close to the lake in Zell am See but is a little further out of the town than The Grand Hotel and is approximately 1 klm from the train station. All the hotel rooms provide stunning views of either the lake and mountains, to ensure guests have a relaxed and peaceful stay in Zell am See. The Hotel Seehof is a smaller 3 star hotel that is located very close to the lake but has the railway line running in front that seperates the hotel from the lake. Some guests who have rooms overlooking the lake do say that the noise can be a little disturbing but there is no doubt that the views certainly make up for it. Other rooms at the hotel offer a view of the Schmittenhöhe mountains, which are equally as great. The hotel is also ideally located near both the bus and the train stations and also the centre of town. The ski lifts are also within easy reach and the Ebenberglift is just 500 metres from the hotel. The Hotel Pension Hubertus, is a 3 star hotel that is located opposite the City Xpress ski lift in Zell am See and just a few minutes walk into the town centre. The location of the hotel is perfect for skiers and snowboarders who wish to stay at a hotel, that is literally just a few steps away from the main gondola/cable car station. The Alpin – Das Sporthotel is conveniently located next to the ski slope and also very close to the City Xpress. Due to the hotels proximity to the piste and lift station, you can ski in and out of the hotel, it doesn’t get closer than this! The hotel is within a few minutes walking distance to the town centre and offers guests the facilities of Pool, Spa and sauna. There is something very nice about being able to return to your hotel and have a quick dip in the pool after a day on the slopes, cycling, hiking or sightseeing. There are several hotels in Zell am See with swimming pools and some have indoor pools, whilst others have outdoor pools. If you want a hotel in Zell am See that offers the ultimate relaxation wellness and spa facilities, the Salzburgerhof certainly is one to consider. The hotel has a 20 meter heated indoor sports pool that has various currents to provide resistance training. it also has a number of different areas for guests to relax in such as the Wellness Schlössl which is 3500 m² consisting of various pools, water jet bath, saunas, pools, quiet and rest rooms, bubbly outdoor whirlpool, along with treatment areas. The award winning Feng-Shui Garden is a place to relax, contemplate and wind down, in a hotel that has been designed to offer its guests total relaxation. The MAVIDA Wellnesshotel & Sport is a 4 star hotel that is located approximately 1.2 miles from the centre of Zell am See. The hotel has both an indoor and outdoor pool which are open to guests all year round. The outdoor pool has two lanes and the length is of the pool is 20 metres, which is ideal for length swimming. The hotel also has a Wellness and spa area that includes several saunas, a solarium, lounges, fitness area and qualified staff offering a range of spa treatments. Located in the centre of Zell am See, the Hotel Neue Post offers outdoor pool (covered in Winter) that is open to guests all year round. The pool is 12 meters in length. The Hotel Neue Post, also offers spa facilities in the ‘Aquarena’, which include a whirlpool, sauna, steaming room, solarium, raindrop shower, infrared cabin and light therapy, silence area that has a waterfall, a gym and fitness room, healing massage and beauty treatments. Located on the Lake, The Grand Hotel has an indoor pool that with underwater massage, Jacuzzi and whirlpool offering panoramic views. It also has its own private bathing beach and sunbathing area, that is great in the Summer months. The hotel also offers a range of spa treatments, sauna and fitness room. Located next to the slopes and the Schmittenhöhe ski lift, the AlpineResort has an indoor swimming pool and spa facilities including a relaxation area with steam bath, hot tub and sauna, along with massage and beauty treatments. If you are visiting Zell am See with your family and are looking for a hotel in Zell am See that caters for families and offer family rooms, then the Kinderhotel Zell am See is a really good place to start. The hotel is designed to cater for families and has 47 family rooms available, a 7 day child care programme, indoor pool, cinema, soft ball area and also an ‘Adults’ only spa area. The hotel is a popular choice with families throughout the year in both the Summer and Winter offering a range of activities for all the family.